With the nominations now closed for the 2018-19 season Australian Wingless Sprint Championship, which is set to take place in a fortnight (February 21, 22 and 23) at Warrnambool’s Premier Speedway in the south-west of Victoria, a record number of 113 drivers have locked themselves in to participate in what is gearing up to be a colossal battle. It’s no surprise that the majority of nominations have come from the host state, with a 69-strong contingent of Victorians in attendance. Hoping to utilise whatever home track advantage they may have, these Victorians will no doubt stop at nothing to prevent any interstate invaders from stealing the Australian Championship crown. The largest interstate field will travel from South Australia, with the 18-car troupe being led by current and two-time Australian Champion Joel Chadwick, who won’t give up his mantle easily as he attempts to claim a record third Australian Championship win in a row. 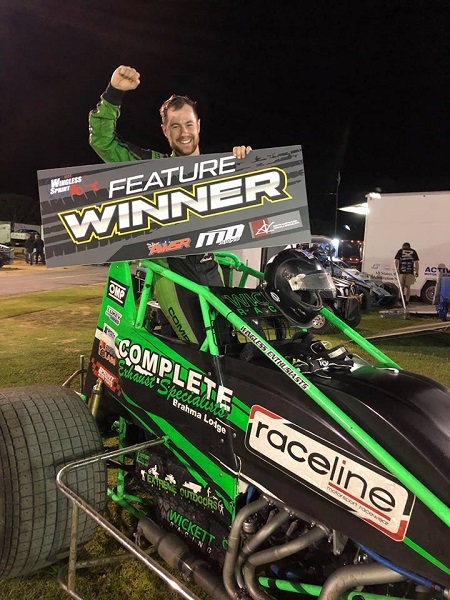 Chadwick will be looking to assert his dominance when he takes to the renowned Premier Speedway track, while his fellow drivers will be looking to continue the trend of South Australian victors. Not far behind South Australia in terms of competitor numbers, NSW are going to be represented strongly with 17 drivers, and with last season’s Australian Championship being held in their home state at Sydney’s Valvoline Raceway, they will each have something to prove as they attempt to clinch the first-place trophy that escaped them last time around. A handful of Tasmanians, including current Tasmanian Champion Luke Redpath, will be making their way across the Bass Strait to the mainland, where they’ll be looking to make an impression when they go up against the formidable line-up of 108 mainlanders. Just one driver will be travelling south from the Sunshine State of Queensland to try their luck in the Australian Championship, while a pair of Northern Territorians aiming to do the same. Making the long 35-hour trek across the Nullarbor from Western Australia, Pittard Racing teammates Chad Pittard and Ash Hounsfield will be the sole representatives for their state. “The amount of nominations for the Australian Championship is a fantastic result and a real testament to our class as a whole,” commented Australian Wingless Sprint Racing President Mick Parry. With a new and exciting format, the horde of drivers will have plenty of laps to hopefully secure themselves a spot in Saturday night’s Australian Championship deciding feature race. Getting underway with scrutineering, practice and the calcutta on Thursday, the last of the scrutineering will be completed on Friday morning before Friday night will see drivers contest two rounds of heat races, with the top-40 drivers in the point standings going on to complete two odds and evens preliminary feature races. Following the opening night of competition, the top 96 cars in points, excluding the eight drivers who have already qualified for the feature race, will return to the track on night two when they will contest a final round of heat races. The top 8 in points will then qualify directly into the feature race and will compete in the Mid-Pack B-Scramble to determine their starting positions. The 2018-19 season running of the Australian Championship will be fought out on the Thursday, Friday and Saturday nights of February 21, 22 and 23.